A couple of weekends ago, we had a beautiful 70-degree day with this year’s glorious fall colors just hitting their peak. On the spur of the moment, I grabbed my backpack and headed out to paint with a friend. I had forgotten to bring masking tape, so I couldn’t tape down my paper to keep it from flying away in the wind. And I had only one measly paper towel for blotting brushes. And no pencil. And I had refilled one of the paint wells in my travel palette with the wrong color. Ah, well! It was such a lovely autumn day that any excuse to get out and enjoy it was a good one. But the paintings from that day? I wouldn’t even show them to my cats! And wow, was it tough hauling around that heavy backpack! I resolved to get myself back in the plein air painting habit. And to have the right things in my backpack. And the stamina to carry it around. Then I came home and emptied out my backpack. Hmmmm. I found several paper towels. And a terry towel. And my acrylic paints and brushes, as well as two watercolor sets. LOTS of pencils. A sketchbook and two ziploc bags of watercolor paper. My journal. Three little spray bottles. Two rolls of masking tape. And a partridge in a pear tree . 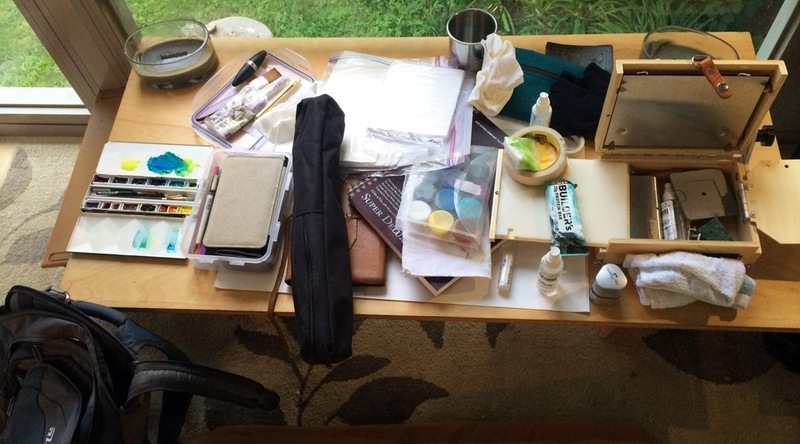 . .
Have you ever been astonished at what you find when you empty out your backpack, or tote, or purse? I’d been carrying around the same backpack for a couple of months. Occasionally, I would think I might have a chance to stop and paint at some point in the day, so I’d toss in some hastily chosen supplies. Sometimes as I scrambled to get to a meeting I’d have to haul a few things out to make room for my laptop or notebook. What I carried to the field that day was more than half accidental. It’s not just my backpack that suffers from this syndrome. I realized a number of years ago that I do the same thing with my to-do list and calendar and routines. I try to spend my time and energy on the things that matter most to me, but inevitably what I actually spend time on includes things I said yes to without really thinking, things I’m doing just because they’re part of a routine developed at some point in the past, chores I did to avoid doing something else, minor emergencies, and a certain amount of procrastination, dithering, and mindless distraction. Eventually, something happens to prompt us to completely empty out our backpacks, totes and purses and repack them with only the things we really need and want to carry around. But when was the last time you did that with your calendar, your to-do list or your habits and routines? None of us can possibly do all the important, meaningful, fun, enlightening, beneficial, healthy, fascinating things we can dream up. If you don’t decide what’s going to fall through the cracks, it will get decided some other way. Someone or something else will decide for you, or it will happen by accident, like the stuff that accumulated in my backpack. If I’m not careful, I can find myself treating my life like I was treating my backpack. Stuffing good, meaningful things onto my to-list in the vague hope that I’ll somehow find time for them. Only canceling or moving things on my schedule when there is something more urgent that has to be stuffed in. Carrying the burden of routines and responsibilities that I really don’t need in my life right now. In the old Celtic calendar, the new year starts in the fall after the autumn equinox, around what is now Halloween, but which was then just “summer’s end.” The time when livestock was brought down from summer pasture, the harvest was in, and the cycle of the year turned towards winter. The turn towards winter was the start of the year. That feels right to me. Autumn has always felt like a time for a fresh start. A time to rest, reflect, husband my resources and make preparations. A time to prune and make room for new growth in the spring. So now, every autumn, I empty my “life backpack”. I sit down with my journal and list everything I’m doing on an ongoing basis, all my routines, everything on my to-do list and calendar, everything that takes my time and energy. Even Facebook and laundry and idly surveying the many constructions tasks still to be done around my house before deciding that first I need another cup of coffee. Everything comes out “on the table”. I spend some time writing about where I most want to spend my energy in the coming few months or year. Not making resolutions so much as reaffirming my priorities. And then I “re-pack” with just the things that I really want and need to carry around in my life right now. This works much better for me than just asking myself what I could remove from my to-do list or routines. When I consider each task or routine in isolation, I can come up with a lot of good reasons why I should be doing it. But, if I take everything out and put things back only until my “life backpack” feels comfortable and stocked with what I really need right now, I make much better choices. The hardest thing for me is remembering to leave some space so the “backpack” isn’t too heavy, and so I have room for interesting and unexpected finds. And, darn it, stuff creeps back in over time. I can’t just clear it out once. That’s maddening, but it’s also comforting. It means when I take something out—of my backpack or my schedule—I don’t have to make a big deal about deciding. It’s not a “forever” decision. It also helps to remember I do not have to be (or look) busy to prove my own importance, or give my life meaning. It’s a certainty that I will miss out on a lot of really great experiences, because none of us can do everything. I may as well just get over it, so I can truly enjoy what’s right in front of me. And I really don’t care what someone else thinks my schedule ought to look like. The truth is, most of the time no one is looking at the contents of my backpack, anyway. They’re all too hunched over under their own. What about you? Are you struggling under a bulging backpack with the seams of your life bursting, forgotten stuff falling out of the bottom and no space for things you really want and need? Well, it’s autumn. Maybe it’s time to empty your backpack. “Willow River, Autumn”, 5×67″, watercolor field study . . . from a different day AFTER I repacked my backpack!